Adrienne Warren, center, leads the crew at hardscrabble Jackson High in "Bring It On"
Producers of “Bring It On: The Musical” have slated a closing date for the high-flying show about extreme competition among high school cheerleaders. The show will play its final performance on Dec. 30 at the St. James Theatre, after 173 regular performances. Discussions are underway for tour dates in 2013. “Bring It On: The Musical” is inspired by the 2000 teen film and features an original story by Jeff Whitty (“Avenue Q”), music and lyrics by Lin-Manuel Miranda (“In the Heights”), music by Tom Kitt (“Next to Normal”) and lyrics by Amanda Green (“High Fidelity”). 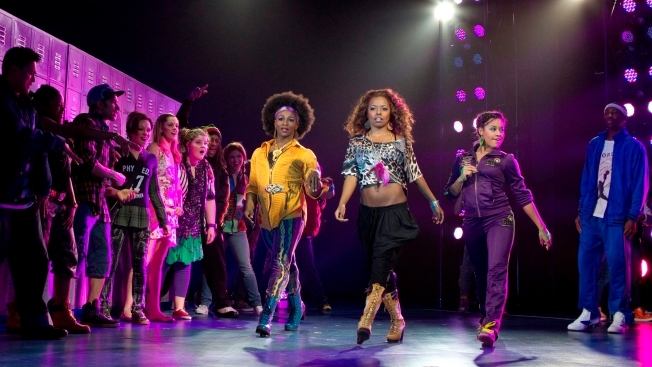 The cast includes newcomer Taylor Louderman as Campbell and Adrienne Warren (“Dreamgirls”) as Danielle. Tickets are available at Telecharge.com (212-239-6200) and at The St. James Box Office, 246 W. 44th St. A limited number of $35 rush tickets are available for every performance, and can be purchased at the box office only, beginning at 10 a.m. the day of the performance.